The move is a significant milestone in the shakeup of the European launch sector as rocket component suppliers, production facilities and operations and sales teams from Arianespace combine in a single organization. Airbus Defense and Space and Safran announced last year the formation of Airbus Safran Launchers, a joint venture that married the prime contractor and engine-maker for Europe’s Ariane rocket program. The companies said they formed the joint venture as a cost-cutting measure with a goal of creating a more efficient supply chain for Europe’s Ariane launchers in response to competition from newcomers to the market like SpaceX. 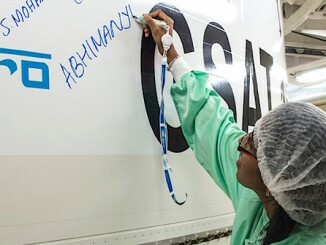 Airbus Safran Launchers took ownership of 39 percent of Arianespace in January. A statement from the French prime minister’s office Wednesday confirmed government’s plans to sell its nearly 35 percent stake in Arianespace to Airbus Safran Launchers, which would give the company control of 74 percent of the Evry, France-based launch provider. The French space agency CNES holds the government’s stake in Arianespace, which flies the heavy-lift Ariane 5 rocket, a Europeanized version of Russia’s Soyuz booster and the Italian-led Vega launcher from the French-run Guiana Space Center on the northern coast of South America. More than a quarter of Arianespace shares will remain in the hands of smaller subcontractors spread across France, Germany, Belgium, Italy, Spain, Switzerland, Sweden, the Netherlands, Norway and Denmark. 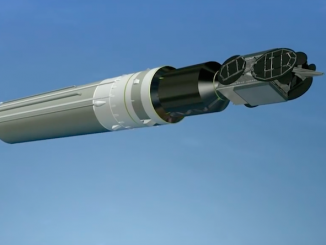 The selloff by the French government will end more than 50 years of CNES leadership in rocket design and development, which included the Diamant launcher in the 1960s, making France the third nation after the Soviet Union and the United States to send its own satellite into orbit. For the first time in Europe’s space program, the new Ariane 6 rocket is designed by the private sector, and will be funded in a public-private partnership between Airbus Safran Launchers and the European Space Agency. CNES remains responsible for ground systems at the French Guiana launch base. Industry officials said the aim of Arianespace’s consolidation is to make the company more vertically integrated, aligning the manufacturer and operator under the same corporate parent and giving Airbus Safran Launchers visibility into more of the Ariane rocket’s life cycle from the factory floor to the launch pad. Launch companies such as SpaceX and United Launch Alliance in the United States, Khrunichev in Russia and Mitsubishi Heavy Industries in Japan supervise rocket production and operations. Airbus Safran Launchers builds the Ariane 5 rocket and delivers the booster to Arianespace at the launch site in French Guiana. Arianespace is the operator, responsible for integrating the rocket with its satellite payloads and launching it. The joint venture will oversee development of the new Ariane 6 rocket set for its first test launch in 2020. 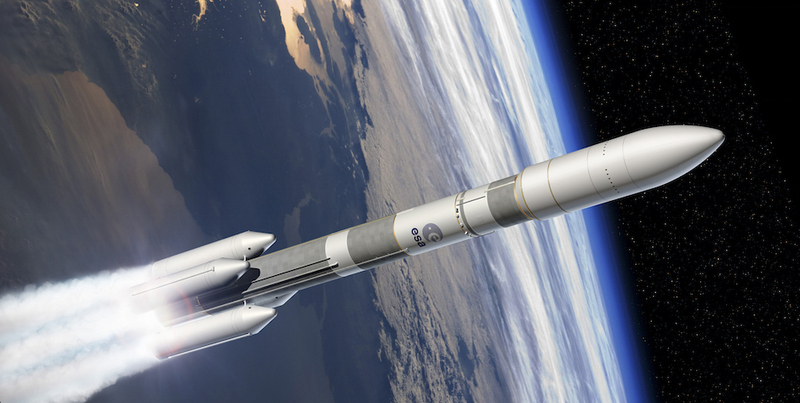 The European Space Agency is expected to sign a multibillion-euro Ariane 6 development contract with Airbus Safran Launchers in July. The French government said it will consult with representatives from European partners and industry when determining the valuation of its shares of Arianespace. Industry officials said the value of the CNES shares is likely to be between 100 million and 200 million euros, or $112 million to $224 million at current exchange rates. Officials said the sale is likely to be finalized before October. Airbus Safran Launchers says it intends for Arianespace to remain in business at Evry. One source said Airbus Safran Launchers will erect a “firewall” to separate the launcher company from the satellite manufacturing division of Airbus Defense and Space, allowing Arianespace to continue launching spacecraft built by Airbus competitors in Europe and the United States. The new Ariane 6 rocket will replace the Ariane 5 in the 2020s and is expected to cost about 3 billion euros ($3.4 billion) to develop. It will be powered by a hydrogen-fueled Vulcain engine similar to the main engine on the Ariane 5 rocket. A new cryogenic upper stage engine named Vinci is being tested to propel the Ariane 6’s upper stage. 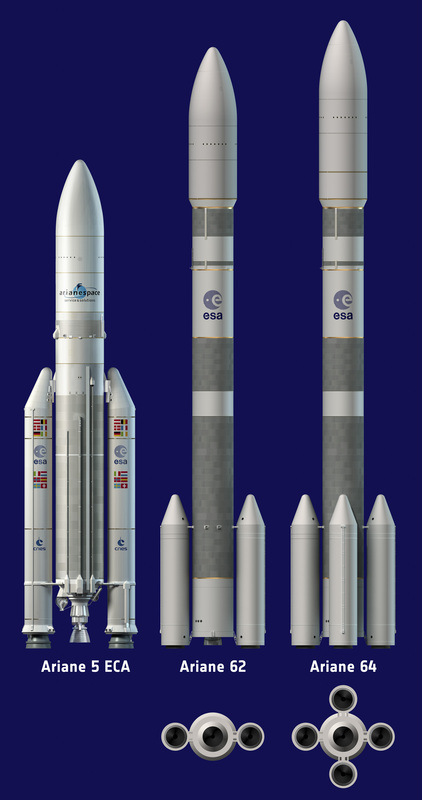 The Ariane 6 will come in two variants — one with two strap-on solid rocket boosters named the Ariane 62 and another with four auxiliary rocket motors called the Ariane 64. Engineers at Airbus Safran Launchers designed the Ariane 6 to employ existing technology — the Vulcain engine is currently flying and the Vinci was already in development — and sought to exploit commonalities with a planned upgrade of the solid-fueled lightweight Vega rocket. 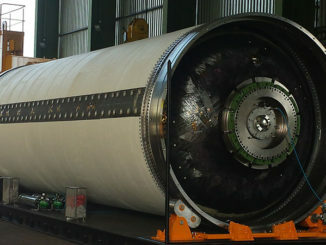 Italian engineers are working on the new P120 rocket motor to launch as a strap-on booster on the Ariane 6 and to power the first stage of the evolved Vega. Airbus Safran Launchers has agreed to contribute 400 million euros ($450 million) of corporate funds to the Ariane 6 program, according to a report in Space News. The rest of the money will come from ESA, which has committed to purchase five launches annually together with European defense ministries and Eumetsat, Europe’s weather satellite agency. Arianespace will target seven commercial launches to get the Ariane 6 to a launch rate of 12 flights per year. The more powerful Ariane 64 version of the rocket can launch two large communications satellites at a time in a dual-payload configuration similar to the one currently used by the Ariane 5. The Ariane 62 configuration is tailored for Earth observation satellites and smaller payloads.